Another intimate little pool tucked neatly behind handsome stone walls… Colorfully stylish lounge seating spread about enticingly… Blue skies overhead, birds chirping in the lush, tropical foliage nearby… A smile, a cold beer, ahh… Relaxation. Bliss. Just your regular, run-of-the-mill pool fun at your everyday elegant hotel somewhere in the Caribbean, right? This is The SERVOTEL, a veritable oasis of comfort and tranquility located a stone’s throw from Port-au-Prince International Airport in Haiti. Some might not believe these images just because it’s Haiti, but even if you’ve traveled to Port-au-Prince before they may come as a surprise. That’s because the area around the airport is not really what you’d describe as picturesque. It’s dusty, ultra-industrial, and usually jammed with loud traffic and crowds. Somehow the SERVOTEL rises above it all, offering a peaceful, soothing environment that’s absolutely at the opposite end of the chaotic spectrum, despite lying squarely within it! I got to stay here twice last year, both times marveling at the level of serenity literally just a short walk back of the main road and only two minutes from the airport! 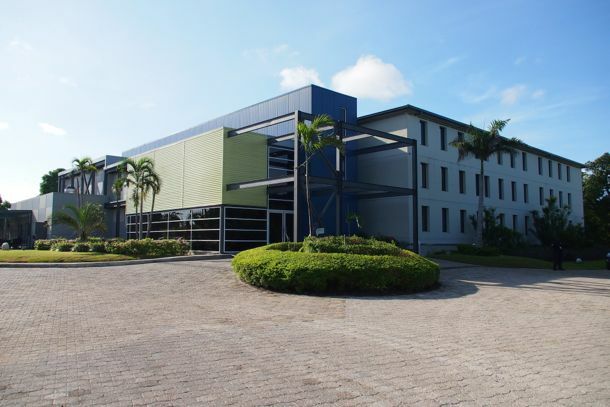 One of the first new properties to debut in Haiti following the January 2010 earthquake (SERVOTEL opened her doors in November 2011), the property is Haiti’s first paraseismic steel building. Now, that doesn’t mean the place is earthquake-proof, but it does mean that a ton of advanced science went into its construction to insure the building’s integrity in the event of a seismic event, and the safety of everyone in it. The exceptional care for guests evident in The SERVOTEL’s construction also extends to the service here, which I found to be excellent. Check-in counter staff, bellmen, bartenders, wait staff – all spoiled me with the type of VIP treatment you just don’t expect at an airport hotel based anywhere, much less Haiti. Comfy beds, free WiFi, flat screen satellite TV’s in every room, and complimentary daily Continental breakfast are all nice too. Rates start around US$120 per-night, though the peace of mind afforded by SERVOTEL’s innovative construction is priceless. For more on Haiti’s SERVOTEL hotel, visit the property website, or check them out on Facebook. Last updated by Steve Bennett on 02/04/2014 . Hotel renovations don't always add up to improvements. In the case of Haiti's El Rancho, though, the math more than checks out.